All In One !!! 90 Free PC Software ~ My Media Centers-PC & Android Games & softwares,Movies, Tips And Tricks & Much more..
Mostly we install various software to do different works on our PC. To Play Video files - We install VLC Player. So let's see how to do all these works with one installation. There is a site to download Free All In One software. You can go to particular site and select the software which you want to install on your PC. you don't need to install all the software. you can select only wanted software and skip other free software. This feature helps you to save your Hard-Disk space and protect your PC from some other problems. How to install this selected All In One Software? 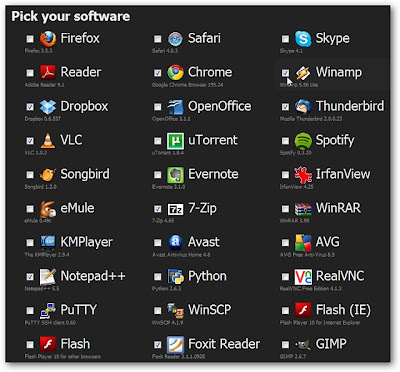 Now select all the Software by ticking which you want to install on your PC. After selecting all the software, Click on "Get Installer"
Now Ninite.EXE file will be download automatically. Now you can install all the selected software by installing Ninite.EXE file.